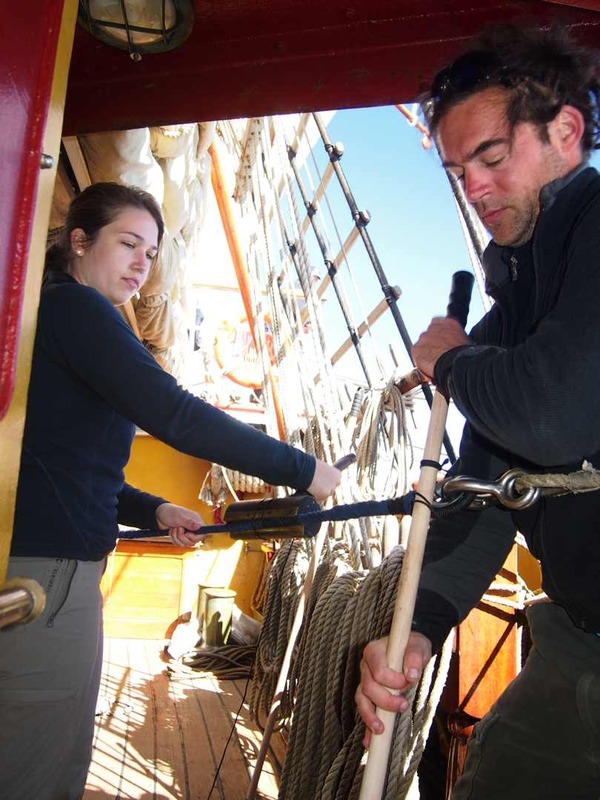 With the Auckland Tall Ships Festival over, the three Dutch ships had much to prepare. And the public holiday on Monday didn’t help. With Europa’s new voyage crew on board on Tuesday afternoon, we made ourselves comfortable amidst the flurry of provisioning and pre-departure preparations happening all around. I was a little nostalgic to be jumping ship and leaving the Tecla and her wonderful crew, who were even more hard pressed with some serious repairs and a nail-biting waiting game ahead of them with important spare parts yet to arrive through NZ customs. Luckily they had made local friends who were helping them out no end. Captain Klaas (Dutch Captain Flag Numero Uno), back at the Europa helm after a few weeks absence, announced our delayed departure for Thursday morning. And after describing how the dangers of the Great Circle trajectory – itself the shortest route between Auckland and Stanley – will prevent us from taking it entirely (e.g. icebergs and treacherous seas), he invited us to be a part of this great undertaking and toast ‘Fair Winds’. At this point we all downed a small sherry glass of good medicine; a suitably Dutch liquor reminiscent (in a good way) of cough mixture. Taking advantage of our extra day in Auckland Harbour and to ensure the crew had ample space to load the impressive array of dry goods, fresh fruit and vegetables and frozen meat [see photos of Europa with provisions on deck] a combined Dutch Tall Ships voyage crew ‘meet and greet’ session was organised for Wednesday morning by our Europa tour-de-force purser and general motivator, Jay, at the New Zealand Maritime Museum just along the wharf from our moorings. A proposal was tabled to share a ship newsletter amongst the three ships during this exceptionally long voyage head of us, with means of communication to include flag signals as well as message bottles; email and radio were proffered as alternatives. After an amazing tour of the Maritime Museum, where many of us heard a great deal about Maori and European sea faring culture, the afternoon was left free, with the only request that we steer clear of the ship busy with final preparations. 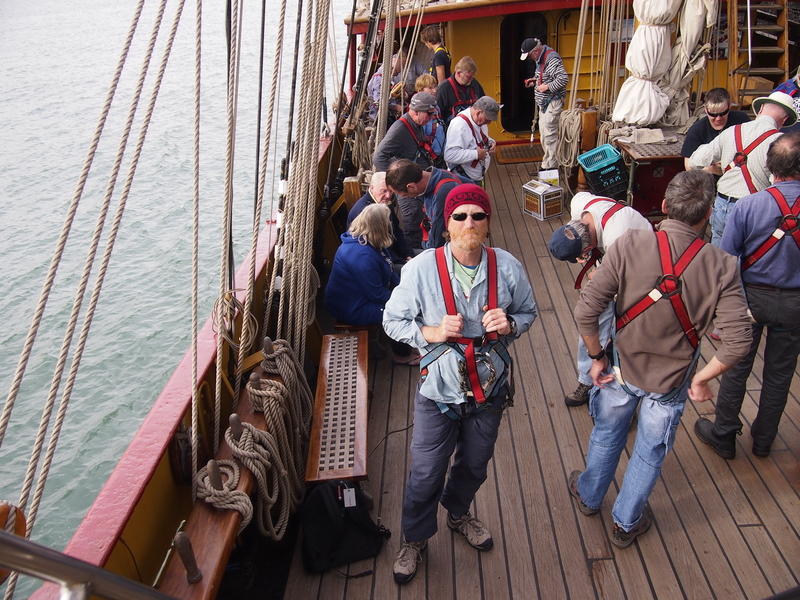 Later in the day training for climbing aloft in the ships rigging was arranged and I volunteered straight up [see photo of me in climbing harness], dying to feel again what I’d tasted in 2011 on board the good ship HMB Endeavour. I climbed all the way to the top of the main mast skysail yard but this time mine was not the experience of tilting horizons and lurching intestines, but rather the panorama of the plush interiors of penthouse suites of the well-heeled inside Auckland’s wharf-side Hilton Hotel. After a few strange stares from the startled hotel guests I descended to the deck. Later on Wednesday evening the crew of the Picton Castle (of the Cook Islands), moored on the same wharf, threw an impromptu party on board with rum punch and popcorn and many from the Dutch Tall Ships came aboard dressed in Halloween-esque garb, with a few pirates as well…to be sure, to be sure me laddie. Thursday morning, three bells rang and we lined up on deck for the safety talk and deck-hand Niels donned an immersion suit. Suddenly he was transformed into a tele-tubbie (his own description). The immersion suit is an important piece of safety equipment, especially for its ability to stop you sliding out of your bunk by shoving it under your mattress when the pitch of the ship is against you. We were ordered to remain on ship for the NZ Customs roll call; a slow and painful exercise wherein the officials sighted all our ‘smiling’ faces. Meanwhile the recently tested life-raft barrels were delivered by truck wharf-side and people assisted with craning them in on the ship’s own block and tackle. With the last of provisions being stowed and the large deep-freezer chest securely ratcheted down on the sloop deck, all were deemed accounted for, and with three Auckland-shattering horn blasts (lucky we weren’t in Christchurch as it may have brought down the last of the damaged infrastructure!) we departed the wharf and made our way out into Auckland Harbour followed by Oosterschelde. Tecla was not ready and would now have to catch up. Stiff north easterlies saw us motoring fast to make it out of Auckland. A whale was sighted. People craned but no one saw it. And the swell was choppy. Seasickness took its toll on many of us as the sun began to set on a stormy afternoon. The lookout position was moved back to beside the wheelhouse as rogue waves and wind were making the deck of the forecastle an unpleasant place to be. But some dolphins riding our bow wave brought some eager viewers back. Increasingly people transformed themselves into heftily clad objects lurching about the deck, as foul weather gear was donned and side nets and criss-crossed hand ropes were strung. After dinner the wind and rain persisted with favourable winds pushing us east. By midnight the heavens cleared and the Milky Way glowed and the Europa masts ticked like a giant grandfather clock pendulum between Orion’s Belt and the Southern Cross. One of my fellow dog watchers from the Northern Hemisphere was happy to have now seen it with his own eyes for the first time. A wondrous thing. Good winds saw us power through the evening on our easterly trajectory toward New Zealand’s most easterly point, East Cape. By midday Friday we’d clocked 174 NM since Auckland– the Captain was pleased, we were more than 50 NM ahead of Oosterschelde. People made good of the fair weather and many an industrious zone was set up around the ship. People were taring shroud lines and stays, painting bottle screws recently loosed to replace mast stays in Auckland and preparing new Flemish Horses using the serving mallet to meticulously wind tarred hemp twine around metal cables already covered in grease and sheathed in cotton canvas taping [see photo of Claudia and Roman working on the new Flemish Horse]. Moderate winds persisted favourable throughout Friday until evening as the early South Pacific summer sun set over the mountainous East Cape region, and sunbeams shot through the ridge-hugging clouds to make metallic the ocean surface. It was soon to be possibly the last land we’d sight until the Falklands. And almost as if to bid us farewell a lone sea lion surfaced by the stern of the ship. 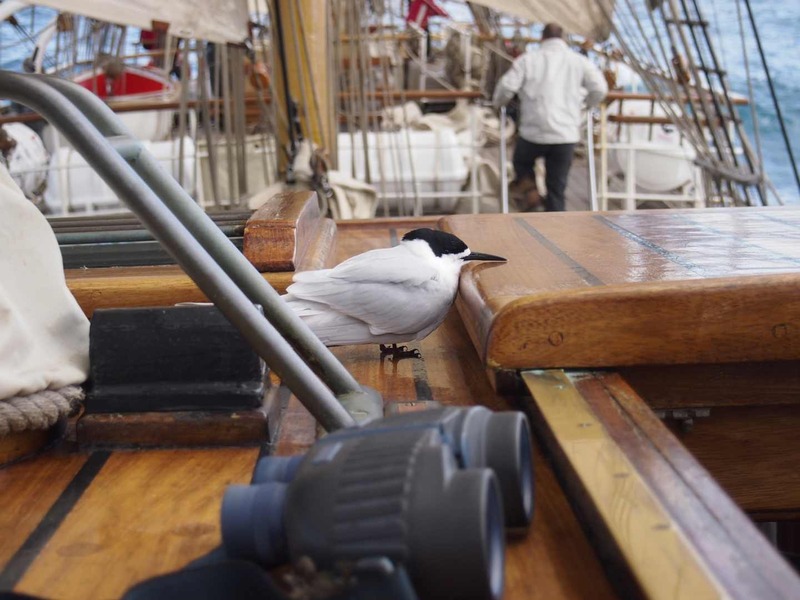 And then too did a lone tern appear [see photo of tern on wheel house], somewhat bewildered and frail, and float and glide suddenly from the airspace over water beside the aft of the ship to that within the rigging of the ship. It hovered about as the ship swayed side to side underneath it until it landed ever so gently atop the wheel house. And there it sat a moment, a little forlorn, perhaps bidding us farewell, perhaps telling us something we needed to know; a tern for the turning back? If it was then we respectfully declined its advice and left it in our wake. Our course was set. The winds died and the East Cape lighthouse faded to the west. And with Venus shimmering on the flattening seas we turned south-east in darkness toward the Chatham Islands.